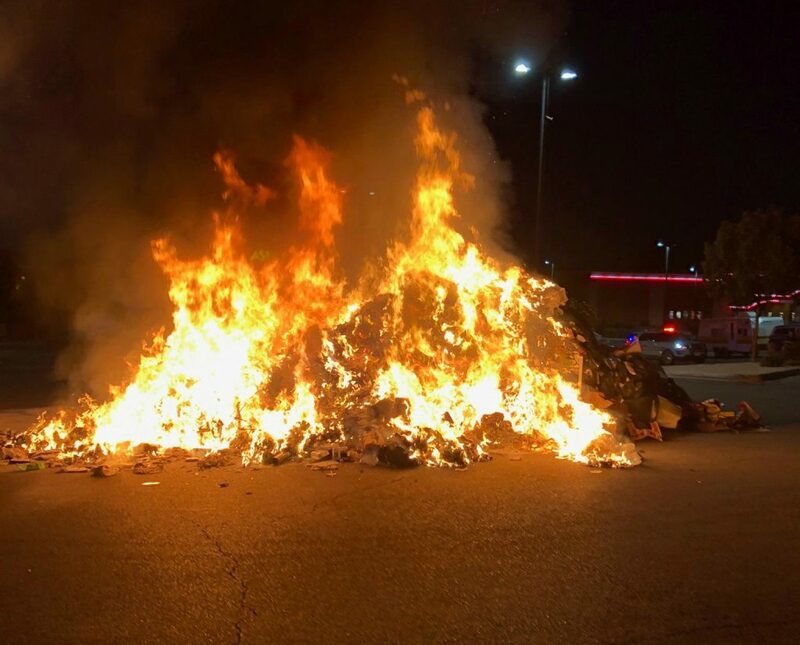 ST. GEORGE — A garbage truck was saved thanks to the quick actions of the driver who dumped the load of trash when he saw flames coming from the rear compartment of the truck near Red Cliffs Drive early Friday morning. 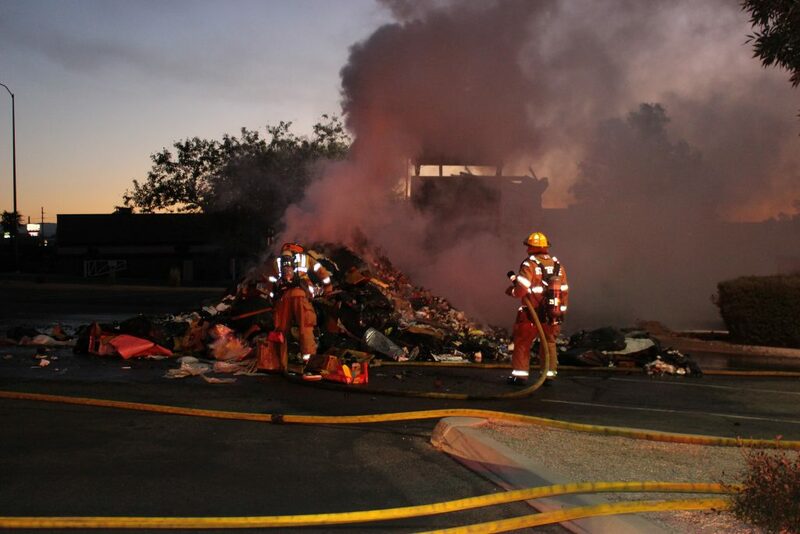 At around 6:15 a.m. firefighters and officers were dispatched to a fire reported near 2376 E. Red Cliffs Drive with initial reports indicating the truck was on fire. 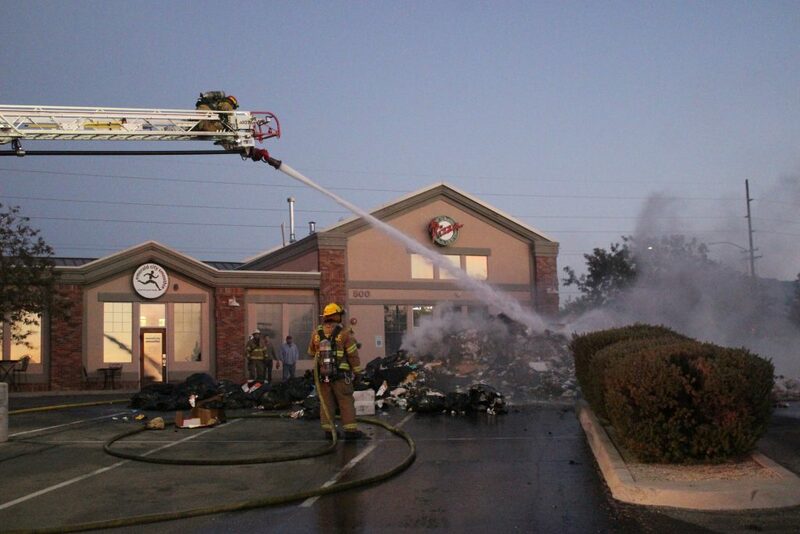 As it turned out, the load of trash was dumped from the truck in the parking lot of Megaplex Theaters at Pineview when the driver noticed flames coming from the internal compartment where the compactor is located. 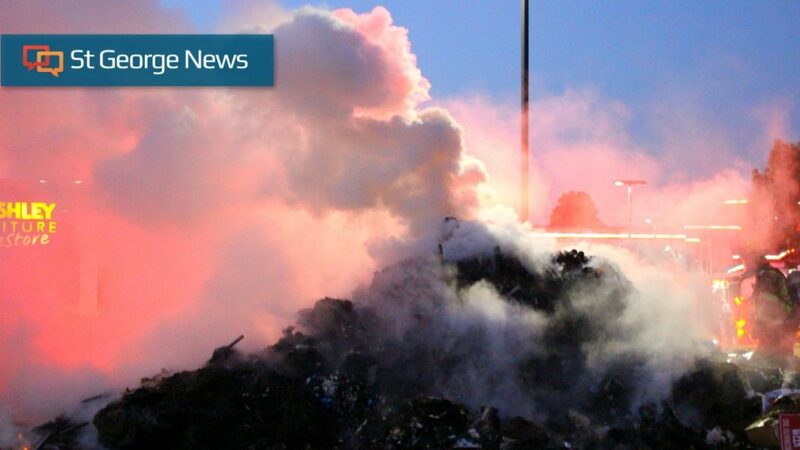 Once the load hit the parking lot the increase in oxygen fed the fire, causing it to spread quickly, said battalion chief Robert Hooper, so by the time firefighters arrived the large mound was completely engulfed in flames. “The driver immediately dumped the load so he did the right thing; he saved the truck and dumped the trash,” Hooper said. 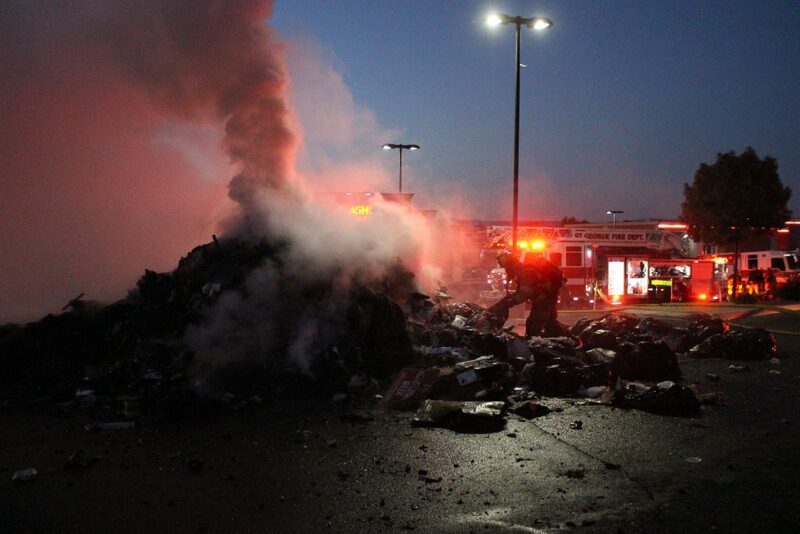 According to a witness at the scene, flames were seen coming from the rear of the trash truck when it pulled into the parking lot just before the load of trash was dumped. Even after the drop, there was burning trash hanging from the back of the truck that was then removed using the internal blade. 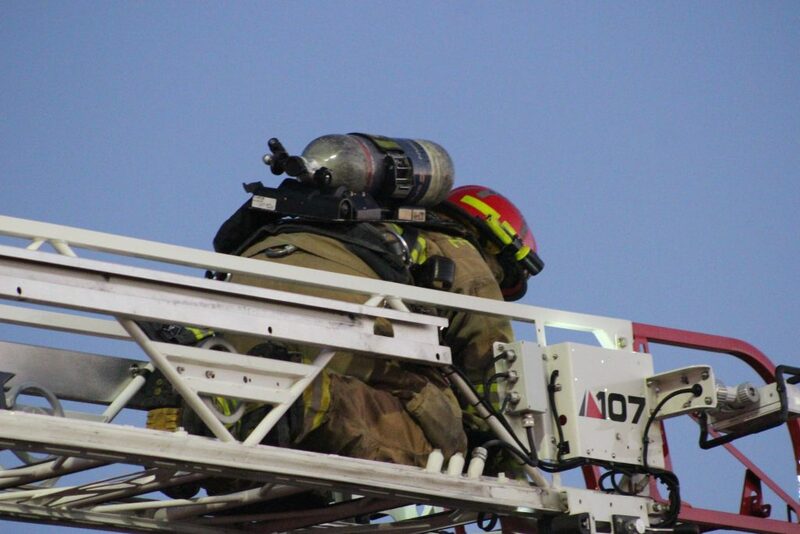 Firefighters continued fighting the blaze for nearly 30 minutes before an extended ladder equipped with a fire pump and automatic nozzle, capable of releasing up to 1,500 gallons per minute, was deployed, which completely extinguished the fire. The exact cause of the fire is unknown at this time, Hooper said, but typically with these types of fires the ignition source can be a lit cigarette that is thrown into a dumpster that is then picked up by the truck. Another possibility is lithium batteries that rub together during the loading or compacting process, which can ignite and cause a fire. 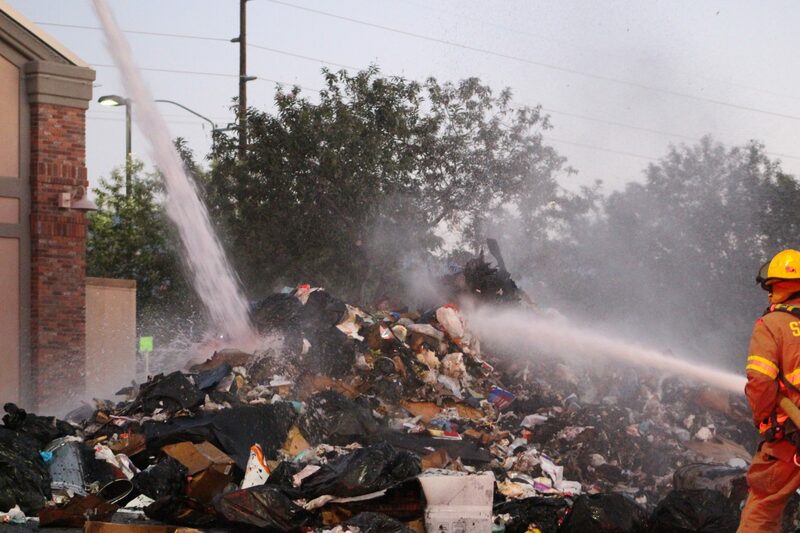 Fire crews remained on scene for the cleanup process and were waiting for a uni-loader to arrive, Hooper said, which would load the debris into a second truck before hauling it away. 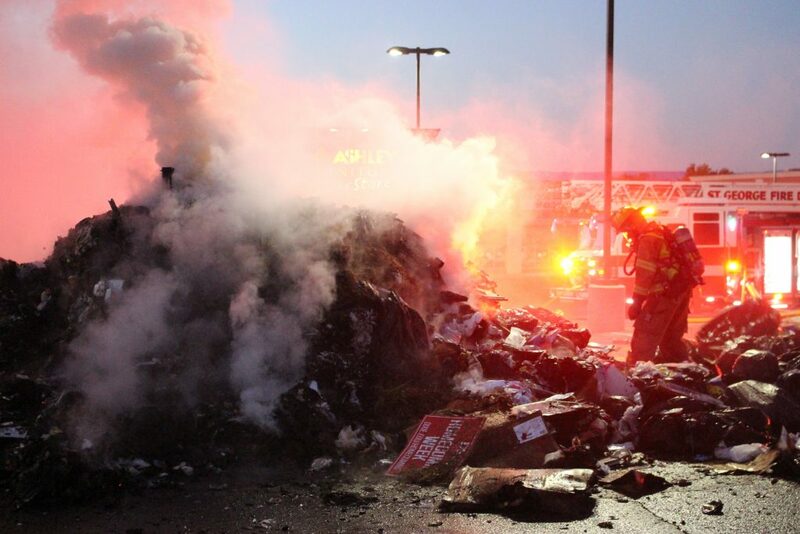 There was no damage to the garbage truck, which was fortunate as some estimates place the cost to replace the equipment as high as $300,000 or more. First time lately that I’ve seen any parking spaces empty around Pineview….Good work guys!